Starmobile together with Smart/TNT launched the PLAY Click LTE, the most affordable Android (Go edition) 4G smartphone in the Philippines. To those who missed it, the Android's (Go edition) OS is designed to deliver the smoothest smartphone experience on entry-level specs. It also has Go edition apps that are designed to maximize space, battery, and processor power. In terms of specs, the Starmobile PLAY Click LTE looks promising for the price. It will come with an easy to hold body with 5-inch 2.5D curved 18:9 Clear Definition touchscreen. Inside, it is powered by 1.4GHz 64-bit Spreadtrum SC9832E quad-core processor, Mali-T820 GPU, 1GB RAM, 8GB expandable storage, and 2,150mAh. It also has an 8MP AF main camera with LED flash and a 5MP selfie shooter. It also has the Band 28 700MHz LTE support for better indoor coverage. The phone also comes with FREE net with freenet app that provides access to sites like GIZGUIDE. 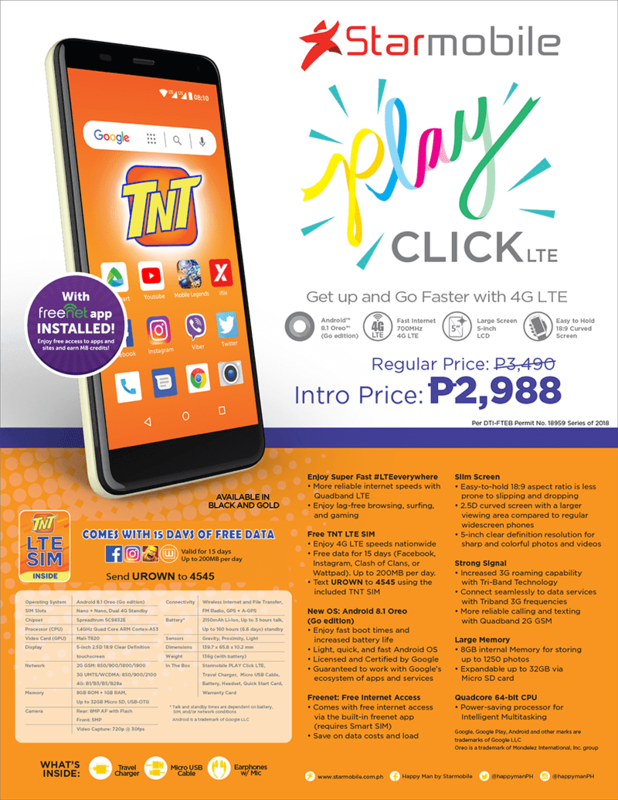 Moreover, the PLAY Click LTE will come with a FREE TNT SIM with 15 days of free access to either Facebook, Instagram, Clash of Clans, or WattPad. It has up to 200MB per day access to those platforms. All you need to do is SMS/text UROWN to 4545. It is also LTE (VoLTE) and Voice Over WiFi (VoWiFi) ready. The Starmobile PLAY Click LTE is priced at PHP 3,490. But, it will come with PHP 2,988 introductory price.